Huge kudos to the snow makers and groomers at Bristol Mt. They provided a flawless carpet of the white stuff for the second installment of the RXCSF Poronkusema series. We had 39-finishers across three races. An amazing 68% of racers had a mother, father, brother, sister, husband, wife, son or daughter racing as well. Nordic is truly a family affair. Racers went from age 7 to 62. In the main event, 6K, Jason Hettenbaugh repeated his victory from the classic race. Chasing him in was RNR team mate Chad Day. Matt Bellizzi rounded out the podium for RXCSF after overcoming a broken pole midrace and finishing with a pole from a Bill Koch racer. Kathy Schwenk from Allegany Nordic shot up the first climb and never looked back to take the women’s race. Ellen Mallery (RXCSF) and Leah Valvo fought a tight battle for second and third, respectively. 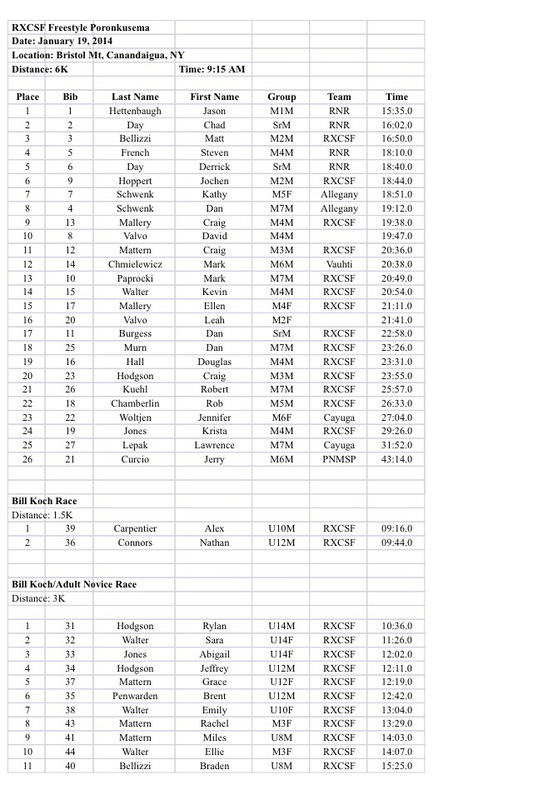 Excellent races by the Bill Kochers who got their first taste of the confusion of a mass start. In the head up race of kids versus moms, the kids also prevailed. Full results below. Next Poronkusema is on Feb 23rd at Byrncliff. It will be a continuous pursuit! Race the first half classical, change skis quick as you can, and finish skating. Should be a challenging course and a lot of fun for adult and kids alike! Super race! Fantastic skating conditions (best so far this year on the race circuit)! Thank you for organizing this event and the other events in the series. I really appreciated having a place to get warmed up and restroom facilities. A very enjoyable day!